Square scarf features: Most of the kerchiefs are small and exquisite, used to match the costumes, to play the role of embellishment. Refers to the red squares covered by the bride’s head when the old wedding was held, or the soft hat worn by the Ming Dynasty literati and the clerk. Modern people refer to scarves.There are many fabrics that can make kerchiefs, such as silk, cotton, polyester, etc. The kerchiefs of different fabrics give people different feelings. Silk squares are elegant and suitable for professional women; cotton squares are soft and comfortable, more suitable for students. The square tower has become a fashion, whether it is in the streets or in the formal place, we can see it. The square towel is no longer a woman’s patent, and many men also have a soft spot for each other. 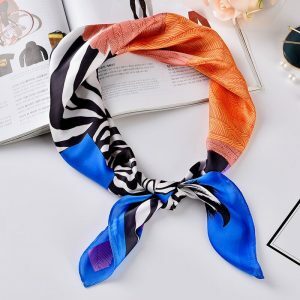 Especially in the autumn and winter seasons, many people who love beauty like to wear a square scarf around their necks, which not only keeps warm but also reflects coolness and fashion. 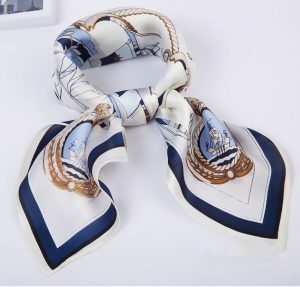 In the activities of the Yixing, the square scarf can play a unique role. When exercising, three circles and two turns around the wrist, which can well buffer and protect the wrist. At this time, the square scarf wrapped around the wrist was slammed on the face, and the sweat was sucked. Use a square towel to tie the hair round and round, as long as the ponytail will be used, especially for women, it can effectively avoid hair damage during exercise. Take a group photo in a place with a flat view, especially according to the group photo. Put a square towel on it and leave a shadow. Get the photo, the one that is the most outrageous is always you. Another important function of the scarf is to keep warm. The cold wind screams, looking for a square scarf around the neck or on the head, can be warm and decorative, is definitely a must-have magic for handsome guys to travel home. When the dust is big, just cover the nose and mouth like a masked thief. It is definitely no worse than a mask. China scarf supplier offers a variety of customized services such as LOGO, color, size, fabrics and more. For detailed workflows on customization, see the Customization Services page. If you still want to know more, please email us and we will answer them in detail.